Artists began to cast their gaze on the change that was transforming America from a quiet, isolationist country into a player on the world’s international stage. 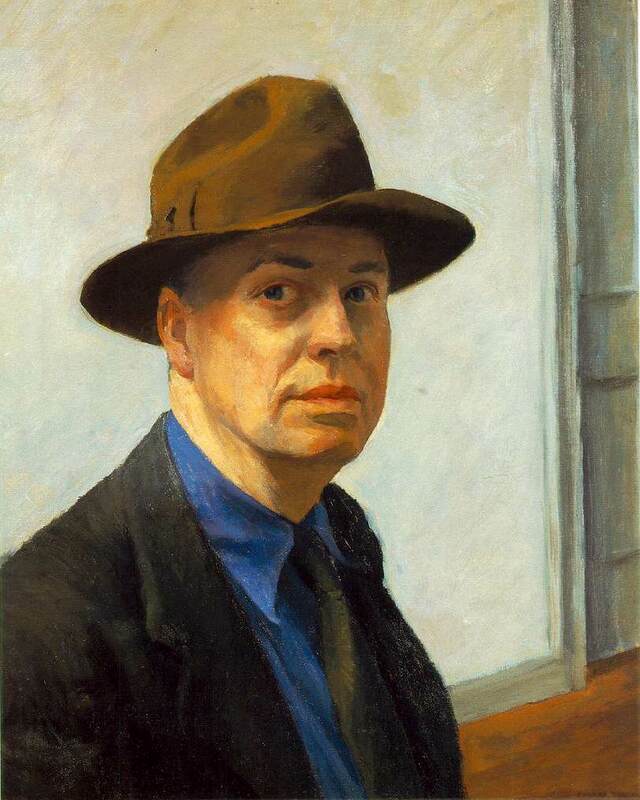 One of those chroniclers of this sweeping change in America was the painter and printmaker Edward Hopper. Hopper strove to capture the most exact transcription of the natural appearance of America during this formidable change. Some critics dismissed his vision of the evolving American scene as boring and banal. Others recognized that Hopper did indeed have his hands and eyes on the American pulse. Lloyd Goodrich, one of Hopper’s biographers, stated in 1950: “Banality was inherent in much of his subject matter, but the strength of his feeling for familiar reality transformed banality into authentic poetry.” What are your thoughts on Hopper’s interpretation of the American scene, do you find his work banal, and what did this artist add to the American culture between the wars and immediately after WWII? Hopper’s work reminds me of Giorgio de Chirico’s early period. They both have an unnerving stillness that makes me feel like something will soon happen, but it never does. They capture moments in the making, and because they are paintings this sense of waiting for something to happen continues for all eternity. Banal? Hopper is able to capture a realistic aspect of existence often avoided by artists until the modern era: life is boring. Life is mostly made up silent unimportant moments. We selectively forget those and only remember the exciting and interesting times. The tension created by the disconnect between his images and what we expect from a painting makes Hopper’s work far from boring. I do not know, in a way i believe that hoppers work is rather dull and boring. I wish that there was just a little form of life in one of these pictures. like yes i see that the piece has people in it but they are so still i wish they had life in them and was caught in some action. I think that in like nighthawks the people should have some form of communication between them, some spark between them…. life is never still, its constantly moving forward. I wouldn’t describe Hoppers’ work as banal but rather mundane. There is a bit of magic to his work where the mundane is almost poetic and melancholy. It’s as if he finds beauty in the routine and his paintings suggest that there is more beyond the ordinary if we really look for it. He added a sense of humanity, compassion and toil in a time where greed and violence seemed to prevail. I don’t find Hopper’s work at all banal. The way in which he portrays America at this difficult time during the wars, is very simple, but I feel that it has a complex meaning. Some of his works gives viewers a sense of familiarity. Perhaps this was his intention during this uncertain time in America. He wanted to capture ordinary, everyday life to remind people of better times. Or maybe even cause them to self-reflect. I don’t think Edward Hopper’s work was banal. In fact, I think that his work represented the true feeling and sense of the American life and culture, especially in a major city. I do think that people are isolated in their daily lives and that is what Hopper tried to portray. Everyone is so caught up in their own lives, careers, and daily errands that nowadays we need to use the Internet to communicate with others because there is no other time. I believe that Hopper saw the beginning of this era where people started to isolate themselves and that is why, I think, his art was so true to the ongoing scene in the American life. I understand why people would think of his work as “banal” at the time. His works seem gloomy even though they are full of color. There is a sense of loneliness and unhappiness to them. They all kind of remind me of scenes of how a horror movie would start out. They are well painted and beautiful, but definitely there is a eeriness that Edward captured in them. These are paintings that reflect on how Edward Hopper was feeling after WWII. It was an uncomfortable time and one can see that in his works. Well this work is far from banal. Second he was doing his own thing while others of the time fell into a category of brand. 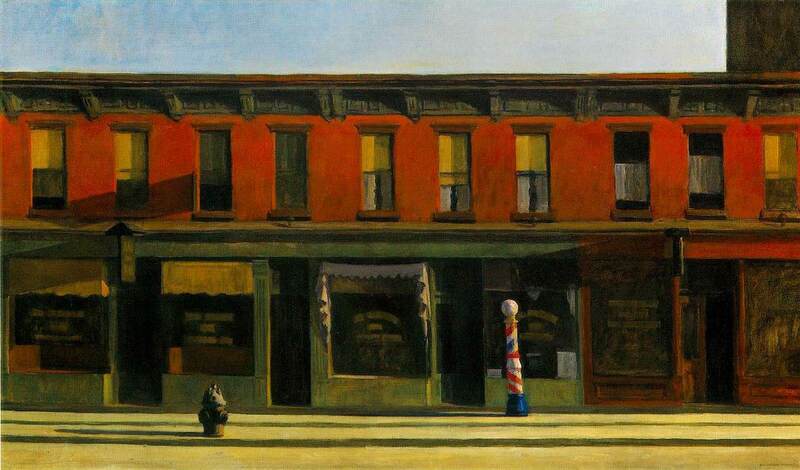 Hopper painted the american scene as it was. It was a banal kind of place for many years. Then he just lived and painted out by his house for other works that were just what he saw. There is emptiness in the work, this should not be mistaken for anything else. Places were empty and desolate thats what drove him as an American. Also hopper had a sense of loneliness in other works not seen here. The eyes are black and no one seem to look at each other as seen nighthawks. All around hopper was himself in time of expressionism in american, I think we can rally owe a thank you to him for being himself and making great works. I don’t see the works of Hopper as banal. I see them as paintings that capture the scenes of everyday life in a beautiful manner not seen before. The way he approach his scenes made people feel a sense of loneliness and loss based on the way he use shadows and color to make the story come out. Paintings by Hopper that capture the emotion and emptiness of places and people that show another side of painting not associated with happiness. This allowed the viewer to see behind the painting and read deeper into the story so as to come up with their own interpreation and views of what his paintings meant. I believe critics misconstrued Edward Hopper’s unique perspective in capturing the post war American culture. His works are sobering reflections of the aftermath of an international conflict with a subtle charm and beauty. It may not be extravagant in subject matter nor loud in color contrasts and intricacies, but I believe it has a quiet charm that is unique and a never before seen perspective in the American art scene. I think that many of the critics who were so quick to judge Hoppers work as “boring and banal” weren’t analyzing it at all, but simply making a fast interpretation of it. If you look at some of his work, like “Rooms by the Sea,” I understand where some people may think that it’s boring and plain, but Hopper is one of the first artists to capture the emotions of America during this time period. He is able to show isolation and loneliness through his work. Either from an empty room or a single naked person staring out a window, the cold and detached colors help evoke that feeling of individual isolation. I enjoy his work because it’s really amazing to me how successful he is in visually portraying such emotions and feelings. The little sense of interaction between people in “Nighthawks” makes me think of a deserted ghost town, where everyone is frozen in time and dealing with their own lives by themselves; a sense of the individual stories that each person has and how it separates them from others, so no I find his work far from banal. I think his work added the cold and expressive emotions that I’m sure many Americans felt during and after the time of war. To me that’s interpreting the American scene correctly. One could say his work is banal if one could say that American life is banal. Describing and portraying life in its current state was different to what most artists were doing. So, in reality it is anything but ordinary. I love Edward Hoppers work and I feel it is more than painting the American scene. There also seems to be an underlying tone of loneliness. When you look at a large body of Hopper’s work the scenes typically have a lone person in deep thought or when there is more than one person in the picture they are not interacting. So there is a glimpse of loneliness even when in company. We can all relate to this feeling and I think it’s not an easy feat to accomplish in art. Every time I look at Hopper’s “Night Hawks” I forget that I am looking at early 20th century art and think I am looking at the famous “take off” painting of Hollywood stars, Marilyn Monroe and James Dean. It shows that subject matter that people described as “banal” can be livened up by adding a human element, especially a celebrity element. Hooper captured some familiar scenes of the typical American society in a realist manner; it could be described as “banal” to the critics at that time since photography was already used conventionally. However, I find Hopper’s work rather soothing to look at in terms of urban scene landscape paintings. His works are also representational and that reflected the character of the American people at that period of recession. Thus, his works did not look optimistic and perhaps people had seen enough. I would not say Hoppers work is boring. But it deffentally has a calming feel to it. Maybe he is trying to express how he is feeeling inside, lonely, captive, someone in solitude. He captured that time period with a silence emotion. People are doing their lives and not worring about the next person. Focusing on themself. He captures this very well. I would not use the word “boring” to describe Hopper’s work. I would say it’s “subtle” in it’s purpose of conveying domestic life of the early 1900’s. “Nighthawks” is probably his most recognizable work, and personally it speaks a lot about that time period in American history. His subjects seem incognito and reserved, as if they are silently pensive of the times to come. Clearly this artist has skill in lighting and shading to create a sense of mood. I would not describe Hopper’s work as banal. I do think it is simplistic in a way but that does not mean that it is boring. I enjoy his paintings because of the simplicity and the great portrayal of society during the war. 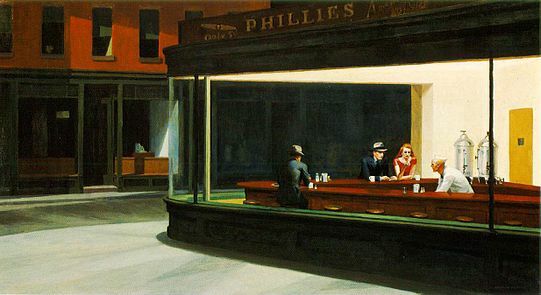 The Nighthawks, is probably my favorite, it might be simple but I think it is doing exactly what the artist was intended it to do, so it is a very successful painting. I completely agree with cuencaso. I do not believe that Hopper’s work was banal at all. I feel like he captured the American life perfectly. I think that may be why some people think that it is boring. They are so used to seeing these scenes every single day that they think it is not as creative. When in reality he is just bringing humanity and telling people how it is. It was their reality. I think Hopper’s work is at time banal. This doesn’t mean that I don’t like it or don’t respect him, however. I think it was important during the time. Someone needed to paint the world in a way that most people see it. The corner store that you walk by everyday, or the barber that everyone goes to is a relevant part of the general public’s life. Not everything has to be idealized and made to look more exciting than it really is. Hopper was able to convey the reality of what most people’s life was like, and in that way it seems poetic. He was real and wanted to paint what he saw to be real and important during a time that many of this was being overlooked. His work is not banal whatsoever. He captures the American culture in a different light and his honesty is completely successful and brilliant. Hopper helped modernize American art and by developing a style that captured the transition that was occurring in America after WWII was impressive and refreshing. He may have captured a scene that may have portrayed something so simple, quiet, and obvious, yet it was not unoriginal. I wouldn’t necessarily say Hopper’s paintings are banal; I would say that they are more reflective and thoughtful. His paintings are a sign of a time period that included WWI, the Great Depression and pre and post World War II which was not an easy time for Americans. I definitely get a feeling of emptiness when I view his paintings which could reflect the absence of American males drafted or enlisted to fight in wars. Many of the people in his paintings appear to not be interacting with each other and instead interacting with inanimate objects or simply looking down which mirrors his very introverted way of portraying subject matter. In my opinion Hooper brought the return to America’s innocence. He showcased simplicity, and allowed his subjects to speak for themselves. The political and social climate was complicated during this time. Hooper captured silence in his paintings and prints. Nighthawks is Hooper’s way of painting peace and tranquility. This persistent stillness was the perfect prescribed medicine to heal America’s time after WWII. Hooper propels the dialog of American culture. His simple and quintessential way of painting silence is what makes his work far from banal; this artistic trait propels him into a league of his own.